"This set of Crinoid parts includes 1 Holdfast and 1 calyx from Eucalyptocrinus and a section of stalk from an undetermined species of crinoid. All the parts are from the same time period and location. The fossils were alive during the middle Silurian Period and are about 424 million years in age. They were found in the Waldron Shale Formation. 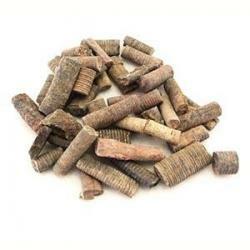 This is a sample of our inventory your crinoid parts collection will be very much like the one pictured here.